WHEN WE SET OUT TO FLOAT THE LENGTH OF THE YELLOWSTONE RIVER from Gardiner, Montana, to Buford, North Dakota, we expected endless beauty, incredible fishing, and fascinating people. We thought we’d learn a little history, maybe even how to properly cast a fly rod. We found all that and more. All along the Yellowstone we uncovered stories that captured the essence of humanity and solidified a movement for the future. As the record-breaking water flow of 2011 subsided, our two boats eased into the waters just outside of Yellowstone National Park. With crew leader Robert Hawkins at the helm of his hand-built drift boat and Shannon Ongaro on the oars of a supply raft, dubbed Big Blue, our small crew began an exploratory journey as part of Hunter Weeks’ documentary film, Where the Yellowstone Goes. “Montana is a special place. Making a film that emphasizes the beauty of Montana and its people is an honor,” said Weeks. igating treacherous Yankee Jim Canyon and getting our rhythm down, there was little time for leisure. But before long, the dramatic beauty of Paradise Valley cast its spell, spurring a spontaneous fly fishing lesson from Robert. Camped on a small river island, we delayed our departure and lined up along the rocky shore to receive instruction. Robert grew up holding a fly rod and we watched intently as he demonstrated the technique. The streaming line caught the warm morning sunlight, reflecting silvery loops onto thin air. We were captivated. The sun rose higher into the sky as we tried in vain to replicate the artful cast. By the time we hit the water that day, Robert had agreed to let us actually use hooks. Ultimately, it was Shannon who caught the first coveted Yellowstone cutthroat. Our mission was to experience the length of the Yellowstone firsthand. Though the “Mighty Yellowstone” is familiar to most Montanans and to any angler worth his or her salt, with this film Weeks intended to get beyond the surface value of the river as a recreational legend and into the heart of what endears so many to the water. Navigating the legally floatable 556 miles of the river would prove to be much more than sunny days and fly fishing. Learning the Yellowstone’s history helped us to not only understand the current climate but it also gave us insight as to what the future holds. Running nearly 700 miles from its source in Yellowstone National Park, the river flows off of Younts Peak into the Thorofare, through Yellowstone Lake, over the Upper and Lower Yellowstone Falls and through the Black Canyon before moving between the Absaroka and Gallatin Ranges into Paradise Valley. It continues on a north, northeasterly route across Montana and just across the western border of North Dakota where it feeds the Missouri River. Before the land was settled, the Yellowstone was known to the Crow tribe as Elk River. The Minnetaree called it Yellow Rock River, presumably for the yellow sandstone bluffs along the lower section of the river. French trappers translated Yellow Rock to Roche Jaune. The name Yellow Stone was recorded just over 200 years ago by Lewis and Clark during the Corps of Discovery expedition. Aside from its namesake yellow bluffs and engaging landscape, the Yellowstone River we know today is a far cry from the river early explorers knew. Western expansion brought new settlers, changing the scenery and local culture. Land was parceled off, homes and full-fledged cities sprang up, rail lines and eventually roadways charted paths along the Yellowstone, offering new opportunities for growth and trade. 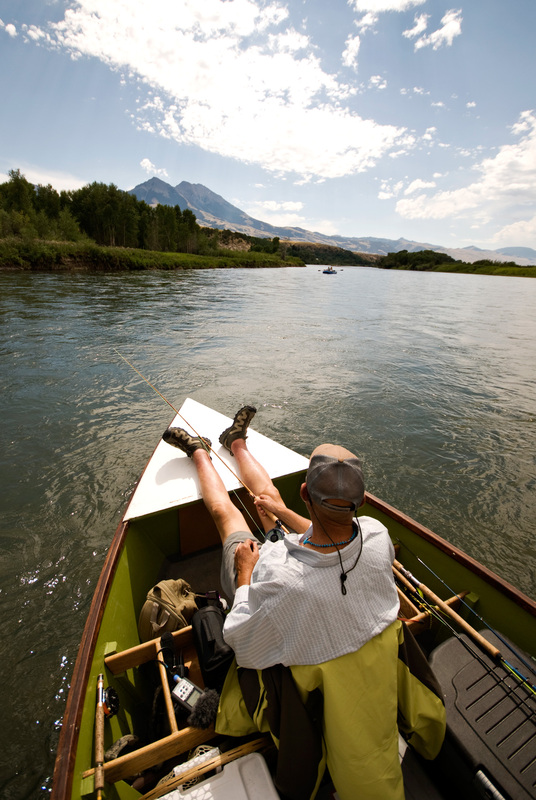 Despite its growth, the Yellowstone has remained one of the most natural, pristine waterways in North America. While being a major source of irrigation, it has escaped dam threats for the last century. Today it is the longest undammed river in the Lower 48. As home to approximately 70 species of mammals, roughly 2,000 species of plant life, thousands of acres of irrigated farm fields, and some of the most desired real estate in America, the growth of the Yellowstone region has only increased the significance of the river. We spoke to everyone about the Yellowstone, from fishing guides and farmers to pilots and homemakers. We’d learned of a few local legends that we contacted ahead of time but many of our encounters were simply with folks we met in the moment. Every person was captivating in their own way. What brought them together was the river. Each had a love for the Yellowstone, but for varied reasons. Tucker Nelson takes pride in grazing cattle on land that’s been in his family since the 1860s. Tom Harmon became an expert on Montana agates after combing the Yellowstone’s shoreline and islands since childhood. Michael Leach uses the Yellowstone for youth education programs while lauding the importance of protecting our wilderness. Mike Sprague developed a company with the specific goal of restoring and preserving rivers, wetlands and streams. With a shared passion for the environment, the people we met recognize the importance of such a special place and understand the unique lessons that could be learned if only future generations would be afforded the opportunity. “Our ability to safeguard these rivers and wetlands will be one of mankind’s greatest challenges moving forward,” said Mike Sprague, of Trout Headwaters Inc., and a sponsor for Where the Yellowstone Goes. Kindness met us at every turn. Livingston resident Margot Aserlind shared memories of fishing with Leroy, her husband of 55 years. The Montana natives split their time between Montana and Wisconsin, where Leroy was a professor at UW and Margot a schoolteacher. In 1990 they settled in Livingston for good. They spent time on the river, built their island cabin into a home, and enjoyed retirement on the Yellowstone. When Leroy passed away in 2006, Margot’s time on the water diminished. She caught her first fish in four years from Robert’s drift boat. It was a healing moment and the triumph enveloped us all. “The river is always there, giving and taking. It’s like a new store every year filled with wonderful treasures,” noted Margot. Each new day offered something special. We celebrated the annual sheep drive with the town of Reed Point. The Trout Headwaters research team taught us the importance of working with the environment rather than against it. We camped on the plush lawn of The Cake Ladies, 80-year-old sisters dedicated to spreading goodwill through their legendary angel food cakes. Our crew met with ranchers and farmers affected by flooding. We witnessed the aftermath of the 2011 oil spill. Roger Muggli shared his passion for increasing responsible irrigation practices that promote healthy fisheries. Out past Billings, two friends with their sons on a ‘Boys Only’ weekend offered food and hot showers at their cabin. A Glendive pilot gave us an aerial view of the Yellowstone, snaking around the rugged badlands of Makoshika State Park. Moving farther east, the land continued to level out, the rocks turned to sand, and the water slowed. Broad sections of river pooled like a lake, taunting every oar stroke. Time was hazy. The sun burned long and hot overhead. Fat, orange lips of carp bobbed up to the foamy surface near the river bank. Motorboats made oddities of Big Blue and the drift boat. We moved as fast as our oars would carry us but Mother Nature had plans of her own. A sudden rain storm blew in just outside of Savage. With nowhere to go we secured the boats and set up a wet, muddy camp. By the time we drifted into North Dakota the agates had disappeared. The shoreline sprang up with the greenest of grass and trees. As we floated in and across the Missouri River, a man cheered as his young son hooked a willing fish. With the sun setting at our backs, we watched as people in nearby boats embraced every last bit of daylight, just as we had for the last 31 days. A month on the Yellowstone taught us about life. We’d become more aware of the world around us and our place in it. Our eyes had opened. There’d been a sense that the trip would be a return to the simple life. We figured things would feel easier than our day-to-day world of high-tech gadgets and consumerism. But simple doesn’t always equate to easy. Modern conveniences, though helpful, sometimes muddy our value system. Our adventure led us to the things that truly matter: family, kindness, appreciating our place, and setting a path for the future. It was those unexpected nuances that defined our journey and sent us home, forever changed. “I’ve spent my life out here, fishing and working, but never really thought about what it means. I want this place to be around for my great-grandchildren,” Robert mused while pushing the oars through the water. The film was always meant to showcase the Yellowstone. It was only after we hit the water and started meeting people that we learned why the river is so powerful. Wild and beautiful, the free-flowing Yellowstone has taught people how to adjust and adapt. People have embraced these waters and strive to protect the natural landscape today. As Montana’s footprint grows, the importance of maintaining the Yellowstone grows with it. 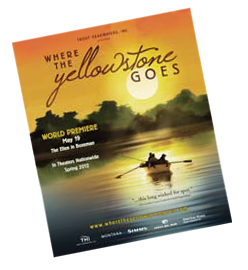 Editor’s Note: “Where the Yellowstone Goes,” directed by Hunter Weeks, will premiere in Bozeman, Mont., on May 19, 2012. Visit www.WhereTheYellowstoneGoes.com for updates. 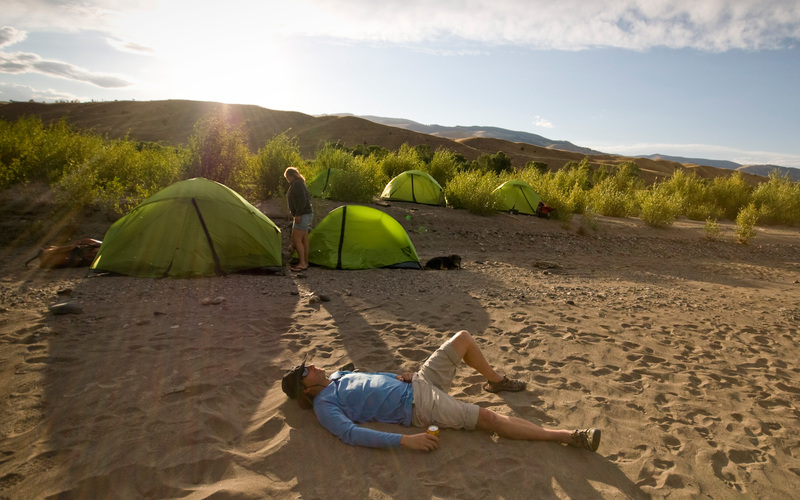 A nice camp spot on a sandy beach in Paradise Valley around day 5 of our journey. Taking in the grand views as we meander through Paradise Valley, Montana. 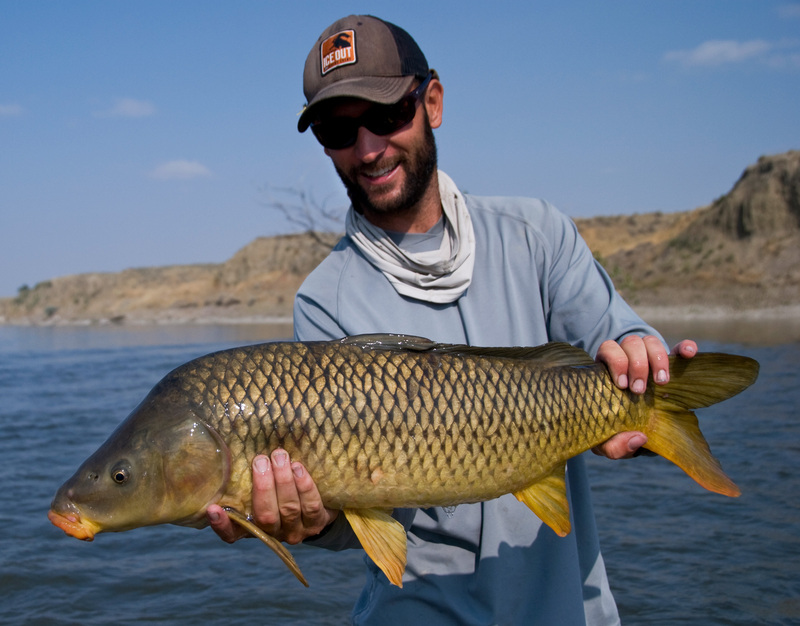 A nice carp caught on a dry fly 50 miles east of Billings, Montana.